Fact Check: Is Obama's Iraq withdrawal plan 'dangerous'? Sen. John McCain said in the debate in Oxford, Mississippi on Friday, September 26 that Adm. Mike Mullen, Joint Chiefs of Staff chairman, "suggests" that Sen. Obama's troop withdrawal plan from Iraq "is dangerous for America." Mullen, in an interview on Fox News Sunday on July 20, was asked what the hypothetical consequences would be in setting a two-year troop withdrawal timeline from Iraq. "I think the consequences could be very dangerous in that regard. I'm convinced at this point in time that coming - making reductions based on conditions on the ground are very important," Mullen said. 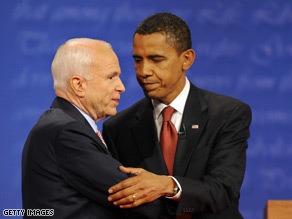 McCain in the debate asserted that "Mullen suggests" Sen. Obama's "plan is dangerous for America." Obama, on his Web site, calls for the phased removal of combat troops from Iraq over a 16-month period to the summer of 2010. He said on his site that once combat troops are withdrawn, a "residual force" should stay in Iraq and the region "to conduct targeted counter-terrorism missions against al Qaeda in Iraq and to protect American diplomatic and civilian personnel." In the Sept. 26 debate, Obama said the war should be ended "responsibly" and "in phases. But in 16 months we should be able to reduce our combat troops." Obama disagreed with McCain's remark about Mullen, saying what Mullen said was "a precipitous withdrawal would be dangerous." Mullen had been quoted in a March 3 article in American Forces Press Service that a " 'precipitous' withdrawal from Iraq would leave the country in chaos." In those remarks, Mullen makes reference solely to the effects on Iraq, but did not mention the United States. In the Fox interview, he also made a distinction between timelines and the Bush administration's backing of "time horizons" for troop withdrawals, which he supports. A spokesman for Mullen told CNN after the Sept. 26 debate that the admiral "has not in the past and will not now comment on positions or assertions made by the campaigns." Verdict: Misleading. Mullen reacted to a question about a hypothetical military move in Iraq - a troop withdrawal timeline. He did not say such a move would imperil the United States and gave no indication that he was talking about Obama's position.